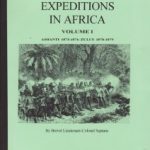 View cart “Khartoum Campaign of 1898 or the Conquest of the Sudan” has been added to your cart. 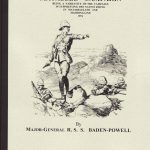 Givanni Finati was drafted into the Army of Kingdom of Northern Italy, deserted while serving in Croatia, fled to Albania, boarded a Turkish ship to Egypt, found himself short of cash and joined the Egyptian Army under Mehemed Ali. He then served in Mehemed Ali’s campaign against the Wahabbis in the Arabian Peninsula. This is his narrative of his adventures and travels. It is a particularly rare firsthand account of the Egyptian campaign against the Wahabbis, the same guys who flew the aircraft into the Twin Towers on 9/11. This work was originally published in 1880. 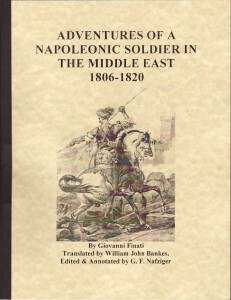 Be the first to review “ADVENTURES OF A NAPOLEONIC SOLDIER IN THE MIDDLE EAST (1806-1820)” Click here to cancel reply.